The NSP represents a new paradigm for recreational watershapes because it is a completely chemical-free, environmentally friendly, ecologically harmonious, and sustainable choice for a swimming pool. Only natural biological processes are harnessed to clarify and purify the pool water. No sterilizers or disinfectants of any kind are used; No ozone, no UV or ions, no chlorine, no bromine, no biguanide, no pH adjusters, no alkalinity adjusters, no algaecides, no clarifiers or flocculants, no oxidizers, and no shocks. The elimination of chemicals substantially lowers the environmental costs and embodied energy associated with constructing, maintaining, and operating a swimming pool. NSPs offer a very low carbon footprint, and the energy efficient pump and filter hydraulics further reduce the environmental impact and long term cost of ownership of a Natural Swimming Pool. John R. Sampino, SCP PoolCorp. 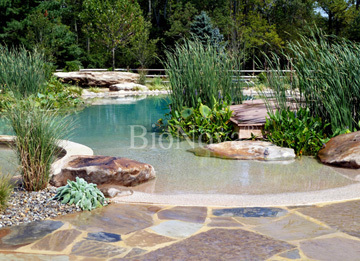 Mr. Alan Weene is Chief Knowledge Officer and Project Manager for BioNova™ Natural Pools North America. 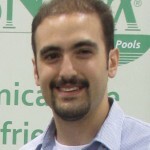 Alan’s passion for sustainability and aquatics led him to join BioNova™ in 2012, where he provides project management and technical planning for Natural Swimming Pools across North America. Alan has been involved in the design and construction of all of the residential BioNova™ NSP installations in the United States. Alan frequently conducts educational seminars on NSP technology to educate and inspire homeowners and industry professionals across the country. Alan found BioNova™ while writing a research paper on sustainable alternatives to chemically treated swimming pools. Alan is a graduate of Connecticut College with a degree in Architectural Studies, and in 2018 he completed the Master of Design Studies in Sustainable Design Degree at the Boston Architectural College. Alan has been around swimming pools his whole life in a variety of roles including swim instruction to adults, children, and infants, pool operation, and Aquatics Management. Alan is an authorized provider for the ASLA Landscape Architecture Continuing Education System (LACES), Genesis University Faculty, a Certified Pool Operator, a member of the U.S. Green Building Council New Jersey Chapter, and an American Red Cross CPR, Lifeguarding, and Water Safety Instructor. Providing Natural Swimming Pool Design, Consulting, Planning, Construction and Project Management throughout North America.